How much is 1 quart of oil on my dipstick? From time to time we get questions from folks who want to know what the indicators on the engine oil dipstick are, how much oil to add, etc. To provide some visual clues, I decided to photograph the dipstick of my 1987 300D Turbo (W124, OM603), add exactly one quart of oil, and then photograph it again. I took an additional photo after returning from the NorCal Diesel Drive. As expected, it looks like the range between the "MIN" and "MAX" marks is about 2 quarts. It was hard to get a good picture of the dipstick with a hot engine because the oil kept wanting to run off of the dipstick. This is non-synthetic oil, BTW -- Chevron Delo-400 15W-40. 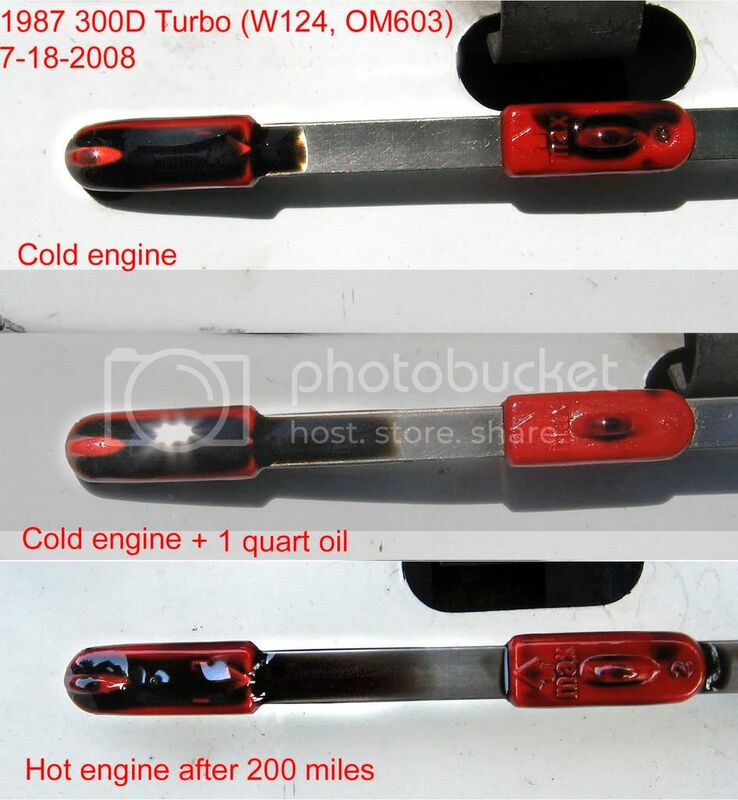 Does Mercedes use this two-quart range on all of its engine dipsticks? Even gassers? looks like you need another half a quart? One quart is between the marks. You might find that you loose less oil if you maintain the level midway between the marks instead of right at the top notch. I have heard this but i havent found this to be true with my 616.. even if i overfill it by a quarter inch. it wont burn it off.. The oil is due to be changed in another thousand miles anyway. The most accurate oil-level check is to let the car set overnight, level ground, and check the level next morning. To know the accurate 1-qt-down mark, you'll need to add the new oil during change, minus one quart and the filter-amount, and then let it set overnight and check it in the morning. (Obviously a different method from the AT fluid check, which has to checked at op temp). My 99 uses the same dip stick. Its manual says the upper and lower fill marks represents 2L, or 2.1 qts. The tech forum techs claim oil is to be checked at operating temp immediately after shuting off. I suggest checking the oil as per the forum and then again after the car has set overnight. I think you'll find that gravity is a slow force inside an engine, especially when oil can find cozy places in a head. Has anyone here experienced constant inconsistent readings on the dipstick for an OM617? I used to get very inconsistent readings on the 616 in my 307d. On the 603 and AFAIK the 606 it takes two quarts to go from min to max. Everyone says your supposed to keep it in the middle. I think you'll find that gravity is a slow force inside an engine, especially when oil can find cozy places in a head. That was the point; the fill level at the sump is engineered to be filled with that oil pumped up there doing its job. Filling and then checking cold 24hrs later would provide for a false full reading; in addition to being a highly impractical method for checking the fill. I enjoyed meeting you as well; your 77 was hands down the nicest condition car there on a age adjusted basis IMO and was cleaner than most on a non adjusted basis too. I don't think his engine is a om617. But good to know regardless. I get pretty consistent readings on our cars....in fact, I've found that if they are filled at or ever so slightly above max, they don't seem to loose it as fast. Probably all in my head. Driving slower seems to result in less oil consumption too. No, the oil should not be checked with the engine cold. It must be checked with the engine at full operating temperature and 10 minutes after it has been shut off to get an accurate reading.